Fig. 1Thought to be the ancient kingdom of Sen kings, Saptari district in Eastern Nepal (fig. 1) houses the ruins of a palace and a temple in Kanakpatti village and Chandrabhoga jungle in the Chure hills (fig. 2). Though some select artefacts have been collected and established in temples at Shambhunath and Aginsair, most of the valuable items lie unattended and uncared for at the fate of nature, with many pieces being stolen by art thieves. 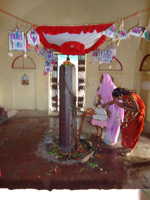 The Shambhunath temple, situated on the south of the East-West Highway, to the west of Rupani houses an octagonal pillar of 5'5" which is worshipped as a Shiva linga. 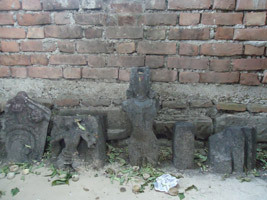 On the outskirt of the temple lie the remnants of an ancient temple – pillars, carved cornice, door jamb, a carved floral motif and many idols – supposed to be brought here from Chandrabhoga. The columns and idols at Shambhunath are similar to artefacts discovered at Chandrabhoga. (fig. 3) The Shiva linga, which is worshipped at Shambhunath, looks like a pillar and unlike other Shiva lingas (fig. 4); locals sacrifice goats and pigeons to Lord Shambhunath. Bhulai Chaudhary, central advisor of the Tharu Kalyankarini Sabha, claims that Shambhunath is Semnath, the god of the Tharus. Later, the name was Sanskritised to Shambhunath and people started worshipping him as Lord Shiva. To the north of the Shambhunath temple and the East-West Highway is Kanakpatti village where carved pieces of stones are found in abundance. A 31' 8" long and nearly 10' high wall of meticulously carved bricks to the north of Kanakpatti village appeared after torrential rains eroded the nearby hills in 2054 BS (around 1997 AD). After the excavation that started in Poush 2061 BS (2005 AD), potsherds, terracotta broken animal figure, terracotta head of Narayan, terracotta torso of Narayan, terracotta torso of Buddha, terracotta Siddha were found among many other antiquities. 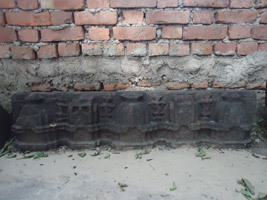 According to Prakash Darnal, the decorated bricks matched with the bricks found in Lori Kudan of Kapilvastu dated 8th – 9th century AD. The locals and elders in the area believe that the Shambhunath, Kanakpatti and Chandrabhoga are related to each other. Interestingly, a round structure with bevel-edged floral patterns matches with the one kept at the southern side of the Shambhunath temple, (fig. 7), further evidence that the temple remnants at Shambhunath were taken from Chandrabhoga. Though this temple in the Chure hills is famous as Chandrabhaga/Chandrabhoga Bhagavati , there is no statue of Bhagavati. According to Amatya, the statues found there might be of Sen kings and queens. 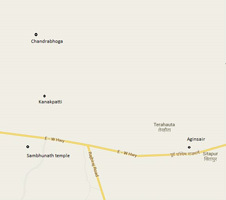 Interestingly, the ruins of Chandrabhaga (Bhagvati) and Kanchha Khoriya (Gadhi) lie 15-16 kms south-east of Gaighat, the Udaypur district headquarters. They are almost at the same distance from the ancient Sen kings capital Udaypur and Chaudandi Gadhi. Fig. 7According to local hearsay, King Chandraketu had established the clan deity Chandrabhaga Bhagavati in the 15th century, but in the Sen genealogy there is no mention of Chandraketu. However, in the Chittaud Sen Banshavali, the Chandrasen has been mentioned as the 27th king and Mukendasen (I) has been said to be the successor of Chandrasen. In Kanchha Khoriya, inside the brick wall of a fort there are remnants of an ancient palace. Excavation is necessary to find out more about the palace. Right now on the surface the remnants of a brick wall, remnants of a brick well and pieces of engraved rocks are found. The size of the bricks is 24 cm x 17 cm x 5 cm. Most of the ancient forts of Sen kings are of stones rather than bricks, so the Kanchha Khoriya's gadhi of bricks has its own significance. Situated in a small mound of Chure hills, it was easy to reach Ambarpur in the Terai region from this fort and palace. Probably it was the winter palace of Sen kings from Chaudandi. Hamilton has written that there were many Gadhis between Kamala and Khando Rivers during the reign of Lohang Sen. He has also mentioned about a gadhi in the Chure hills. Fig. 8Hari Kant Lal Das, a professor of history from Rajbiraj, says that the ruins in the Chure hills are remnants of Ekagarh, the winter palace of the Sen kings. According to him Chandrabhoga was the clan deity of Sens. At the time of the unification of Nepal, except for Makwanpur in the east, Bijaypur and Chaudandi were under the rule of the Sen kings. Saptari was ruled by Sen kings from Bijaypur in earlier times. Later, after the establishment of Chaudandi, Sen kings ruled from Udaypur in Saptari. As Udaypur used to be cold during the winter, the Sen kings of Chaudandi chose Ambarpur in Saptari as their winter capital. As there are no remains of Ambarpur, it is believed that the area near Shambhunath was once Ambarpur. Bouli Chuadhary writes in Tharu Sanskriti: According to old people, Shambhunath and Debnath are siblings and King Chandrasen was their maternal uncle. In Chandrabhoga jungle was the palace of King Chandrasen. Shambhunath, on being beaten by his maternal aunt with larna (a ladle like kitchen tool made from bamboo used to stir while roasting cereals) for irritating her while she was roasting rice, took the form of stone and appeared in the dream of the priest of the temple in Chandrabhoga and asked him to take him to the southern plains. The priest discussed the issue with village elders and they went in hordes to Chandrabhoga with bullock cart and musical instruments. However, the bullock could not pull forward the weight of Shambunath. When the priest prayed, Shambhunath said that he was a little boy so he would like to ride a toy cart. When they put him in a toy cart, it started to roll and stopped at the place where the current temple has been built. 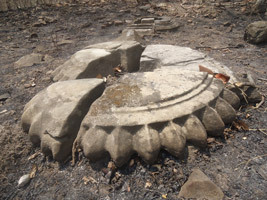 Among the many artefacts and remnants of temple in Chandrabhoga is a round pillar which is regarded as Debnath, Shambhunath's brother. However, I was not able to find it. Sixty year old Amrit Lal Chaudhary of Khoksar village corroborates the tale. According to him, the current Shiva linga at Shambhunath was swept away by floods from the Chandrabhoga temple. As it landed in Khando River, shepherds tried sharpening their knives on the abandoned piece of rock. However, the stone bled like a living thing, frightening them away. Later, in a dream of a man from the Shambhunath area, he (Shambhunath) asked the man to take him to the place where the current temple lies these days. The villagers came in groups with drums and musical instruments to receive the god. But he didn't move when they loaded him into a bullock cart. Once again, the Shiva linga moved only when they put it in a cart meant for children. Chandrabhoga, though visited by villagers from the surrounding area only once a year, has significant cultural and religious value. Tharu villages have a Dihibar Than in the south of every village and a Shira Than in the north, shira meaning place of origin or head. Dihibar is the village deity and the Shira Than is a common worshipping place of many villages in the vicinity. The locals sacrifice goats and pigeons so that they and their cattle are not attacked by wild animals and evil spirits from the jungles. Locals in the vicinity of Chadrabhoga consider it their Shira Than and make sure to offer a goat to the deity once a year, individually or collectively. Those seeking to get rid of individual problems go to Chandrabhoga on the first day of Baisakh and offer a goat or pigeon to the deity. The villagers collect beheri, a collective contribution, buy a goat, and offer it to the deity on the same day. This tradition brings all the villagers together on the first day of the year, enhancing harmony amongst them. Though sacrifices are made at the place, it has still not been confirmed whether the deity in the Shira Than are Hindu gods and goddesses. 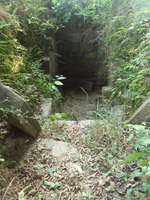 Like Chandrabhoga, there are many Shira Thans in the Chure hills, one being Aginsair in the vicinity of Sitapur village to the east of Chandrabhoga. To about four kilometres east of Rupani and to the north of the East-West Highway lies Aginsair. It is considered another Shira Than by the locals. The locals have built a temple and housed the main sculptures inside the temple. Among the prominent ones are the idols of Aginsair and Bagheshri as called by the locals. Nearby is an enclosure of rectangular well-cut and chiselled stones (fig. 9). On the entrance of the enclosure are two pillars (fig. 10 and fig. 11). According to Prakash Darnal the enclosure might be a sanctum. Fig. 15To the west of the temple, temple parts and pillars have been kept. (fig. 15) People light clay lamps and incense at this site. Around the temple are big stone blocks and baked bricks. 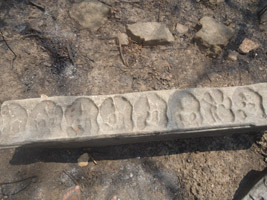 The stone blocks match with the ones found in Chandrabhoga. Sahabir Chaudhary, 60, from Sitapur said that nobody knew about the statue of Aginsair. However, it was giving a hard time to the villagers. Like Shambhunath, he appeared in the dream of an old man and asked him to start worshipping him on the first of Baishakh. The statue was then dug out, people from 14 mauja came together and decided to offer prayers and offerings to Aginsair on every first of Baishakh. The first priest appointed was Haleshar Raj Bantar and till date a Raj Bantar (a caste in the Terai) has remained the priest of the temple. Raju Chaudhary, 75, the grandson of Jhanjhu bataha who threw the idol of Aginsair in a well said that it is his 6th generation in the Sitapur village and they have been offering prayers and sacrifice at the shrine every year continuing the tradition started by their forefathers. 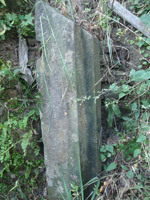 Many wells of stone blocks have been found in the area. However, no excavation and investigation of the place has been done. Many statues have been stolen from the spot. People offer prayers and sacrifice at Shira Thans on the first of Baishakh. Musharu Das, the Thanpati (caretaker of the Than) from Sitapur village said that the first offering to Aginsair is from Sitapur. Only after that the villagers from other villages offer their prayers and sacrifice. Likewise, at Chandrabhoga the first offering is from Terhauta village. Bhikhan Chaudhary, 72, from Sitapur said that Aginsair was notorious. He used to go to the new brides which resulted in their deaths. He used to take the form of a tiger and roam around giving a hard time to people. To contain him, people started worshipping Aginsair and offering animal sacrifice to him. After they started worshipping Aginsair, the wild animals stopped attacking cattle and people in the vicinity. People vow at the temple and offer sacrifices of pigeons and animals after their vows are fulfilled. The shamans claim to have felt the souls of Baghesri and Aginsair entering their bodies. 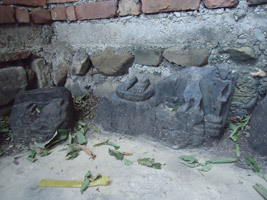 One of the statues found in Makwanpur is that of Singhabahini Bhagvati – Bhagvati riding on a lion. Aginsair also has remnants of a statue of a tiger or a lion. And the people worship it as Bagheshri – so that She will keep away the wild animals from their livestock. This supports the belief that the remnants are from the Sen dynasty temples. During my visit to the western Nepal (Dang, Deukhuri), I found the Tharus worshipping Baghesri to ward off the wild animals while grazing their cattle. Some historians say that the Sens were Vaishnava, perhaps because of the ancient Vansa Gopal (a form of Krishna) temple in Markwanpur fort, but their main deity being Raj Devi, a form of Durga, it doesn't seem to hold true. Raj Devi temple in Rajbiraj has a Tharu priest. Similarly, the main priest of Chandrabhoga is a Tharu. This shows the connection of the Tharus with the Sen kings. In the main temples Kamal Devi and Raj Devi in Makwanpur, no statues are worshipped but only the stones. Tharus too have no idols in their inner sanctum, they worship mounds of earth. As per the antiquities found by the investigation team of Department of Archaeology, it can be assumed that the ruins found at Chandrabhaga and Kanchha Khoriya might be the ruins of an ancient gadhi, palace and temple built around the end of 15th century to the start of 16th century. According to locals the statue of Vansa Gopal in Makwanpur Gadhi has been tied in shackles to prevent him from going to the mustard fields and destroying the mustard. (Makwanpurka Kehi Puratatvik Upalabdhi) It connects well with the local hearsay in Saptari’s Chandrabhoga and Aginsair. They say that when Shambhunath ran away from Chandrabhoga after being beaten by his maternal aunt, he passed through fields of mustard before turning into a stone. 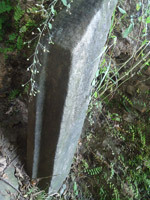 The top part of the pillar representing Shambhunath has a dent and as per the belief it looked as if smeared with yellow on the top. Likewise, while talking to the old men in Sitapur, they too talked about Aginsair passing through the fields of mustard. They said that when the statue was dug out, it had the yellow color of mustard all over it. It connects with the story of Lord Jagannath that has the mention of sprinkling mustard seeds along the path to track the path once the seeds sprout out. In Makwanpur, the Sen kings invited businessmen, artists, and performers from India to entertain their people, starting from Ram Nawami. The fete would last for a fortnight and even a month at times. The Makwanpur folks used to barter the Indian items in the fete. The tradition of a month-long fete starting from the first of Baishakh and continuing till a month is still being carried out in Shambhunath of Saptari district. It further seconds the reign of Sen kings in the area. According to Matrika Prasad Koirala, the Sen kings used the word ‘Rupanarayanetyadi’ in their eulogy or Prashasti. It is said to be related to Rupanagar which was the capital of Sen kings. Rupanagar and Rupani in Saptari district fit the description and qualify as being the site of the capital of the Sen kings. 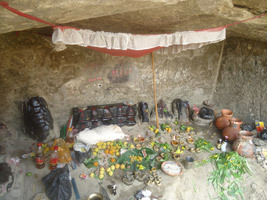 The area near Rupanagar is supposed to have idols and statues in the caves in Chure region and have lots of antiquities. It is also assumed that the area surrounding Shambhunath might have been the ancient capital of the Sen kings Rupanagar. However, as per the preliminary reports of the excavation in Kanakpatti of Khoksar Prabaha and the antiquities found there, the area was a hub of ancient settlement long before Sen dynasty rule. The whole area, if excavated, can perhaps unearth an ancient settlement like Lumbini. Darnal, Prakash, Preliminary Report on Khoksar Excavation in 2061/2062 B.S. (2004/2005 AD), Ancient Nepal 180, April 2012, 6-40. 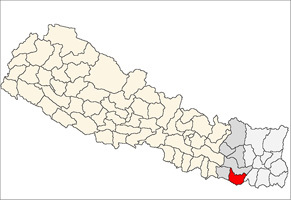 Das, Harikant Lal, Saptariko Rajnaitik Itihas Tatha Pramukh Dharmik Sthalharu; Sanskrtik Sthalharu Samet, Rajbiraj Sajha Pustak Bhandar, Nepal, 2056 B.S.,176..
1. 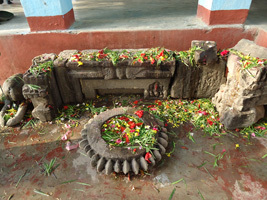 Chaudhary, Sanjib Kumar, The month of Baishakh and the Shambhunath temple, Tharuculture.blogspot.com, 9 May 2012. Providing feedback, Bhulai Chaudhary claimed that Shambhunath is actually Semnath, a Tharu god. 4. 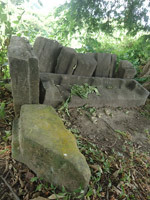 Amatya, Saphalya, "Saptariko Chandrabhaga Ra Kanchha Khoriyako Bhagnavasheshaharu, (Ruins of Saptari's Chandrabhaga and Kanchha Khoriya)" Ancient Nepal 49-52, December 1978 – July 1979, 15-25. 5. 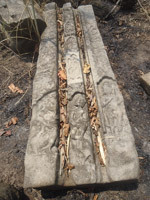 Amatya, Saphalya, "Saptariko Chandrabhaga Ra Kanchha Khoriyako Bhagnavasheshaharu, (Ruins of Saptari's Chandrabhaga and Kanchha Khoriya)" Ancient Nepal 49-52, December 1978 – July 1979, 15-25. 6. Hamilton, Francis Buchanan, An Account of the Kingdom of Nepal and of the Territories Annexed to this Dominion by the House of Gorkha, New Delhi, Manjushri Publishing House, 1971 , 160-165. 9. Darnal, Prakash. In an interview with the author, he claimed that the enclosure must be a sanctum. 10. Amatya, Saphalya, Makwanpurka Kehi Puratatvik Upalabdhi, Ancient Nepal 14, 1971, 41: Amatya seems to use "Vaishya" in place of Vaishnava in his article here, but later refers to Vaishnava in the same passage. In the same way he substitues "vatsa" gopal for vansagopal or bansagopal. Sanjib Chaudhary is Nepal author for Global Voices (https://globalvoicesonline.org/author/sanjib) and writes about Tharu culture and traditions in his blog "Voice of Tharus" (http://tharuculture.blogspot.com). A brand and communications specialist by profession, he regularly blogs (http://sankuchy.blogspot.com) and writes covering a variety of issues.